So Daniella who blogs at Famous In Japan told me about this new tag on Twitter this evening! 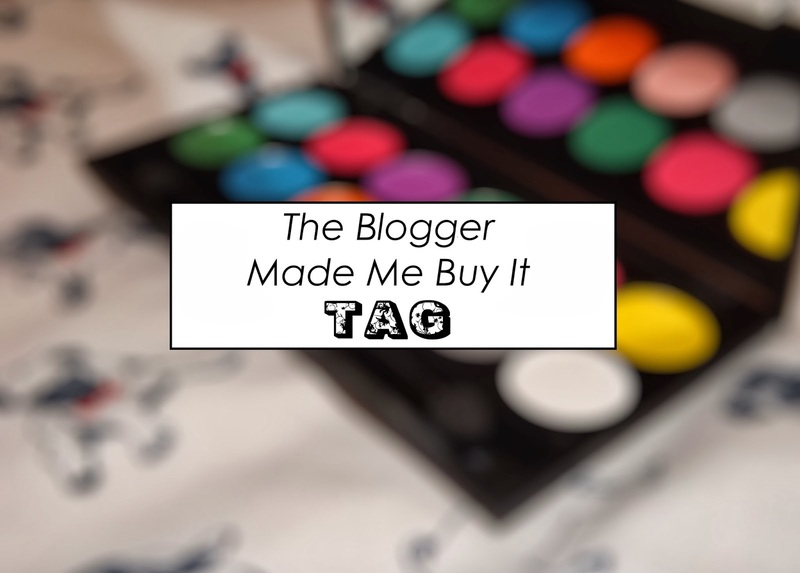 I was really intrigued, of course because I hadn't seen it before and also because I knew it would make me think about all the things bloggers could have influenced me to buy! It's an interesting one and I think you should read on and maybe do the tag yourself! What do you say? 1. Who are your most influential bloggers? I think I'm mostly influenced by the usual suspects. When it comes to beauty, it's definitely towards The Sunday Girl, I love that she's pretty much reviewed everything and I always find her reviews spot on! Otherwise you'll see me looking at what Lily Melrose thinks! Lily Melrose again, I find to be more of a fashion influence than a beauty one. I love her style and how she styles the same thing in so many ways! I also like the girls that write: Little Winter, The Briar Rose, Amy Valentine and That's So Yesterday. I love little bits of everyone's style and I take influence from these girls the most! 3. What is your most favourite item that you have bought as a consequence of blogs? Only one item popped into my head when I thought of this and this is the Estee Lauder, Bronze Goddess Perfume. I bought this solely because Lily Melrose had raved about it for so long, that I wanted to try it myself and after smelling it I had to have it. I'd never seen anyone else rave about it, so I bought it solely because of her and is now my favourite scent that I own! 4. What is your least favourite item that you have bought as a consequence of blogs? I once bought the MUA Pro-Base Complextion Kit based on a review and I have to say I was really disappointed in it. I kept it a little longer so that I could try it, just in case and not long ago, I threw it away because I barely used it and didn't like it. 5. Name 5 products you have bought recently as a result of blogs. I don't often buy products because of blogs, but I do become influenced by similar or related posts to buy certain brands or into a certain style. When it comes to fashion, because I work in the fashion industry myself I sort-of subconsciously work my style and likes around trends and best sellers! It becomes obvious later on... I bought the tartan smock dress most recently from Topshop based on the smock dress hype that is widely loved by the blogosphere. I ended up buying a felt black bowler hat because of the same reason, as well as the eBay white skort that I hunted down after seeing a blogger wearing it and raving about it. Beauty wise, I always wanted to try Sleek palettes and after reading a few reviews on them, and then I ended up buying two! I also wanted the Marc Jacobs Honey because of a blogger wide love, and eventually got this one for Christmas... Cheeky. 6. Have you ever given in to blogger hype? If so, which hype? I gave into the skort hype pretty quickly! It was love at first sight with this since I have issues with skirts and shortness. I love my white skort and I wish I had more to wear with it... Maybe in fact have it in a different colour or two? It's still a favourite piece although it's very summery, but skorts are still making their way round the high streets now so I'm glad they're still in trend! I also fell into the ombre hair thing last year and was one of the many bloggers who suddenly went for the big chop at the beginning of the month. I'd done mine in December though, so I can happily say I was one of the first to do so! 7. Have you ever avoided blogger hype? If so, which hype? I widely avoided the Urban Decay Naked 3 Palette hype as much as I could and this is only because I wanted to be a part of it so so badly! I still really want the beautiful palette, but I don't think I can justify spending £35 or more on it... Maybe later on as a big treat? 8. Is everything you buy based on blogger reviews, or are there some items you buy without checking a review? I try to be as original as possible when it comes to my clothes. I take inspiration instead of copying and then incorporate it into my own style for a look that's got my name all over it! As for beauty products, I like to read before I buy. Mostly with higher end products that cost a little bit more, are a higher end brand or things like foundation and concealers. Reviews matter with these things because you'll want the most for your money. But if I see something I like the look of or it's brand new sometimes I can't resist and I take the risk. It also depends on if I've eyed it up before hand or not! I loved writing this tag! It's really made me think about the way I shop and how bloggers can affects what I buy! I prefer blogger reviews to reviews on the products itself or forum websites because it's other girls like me and you writing about products that we want to talk about and care about sharing with our beauty loving community. And I'd love to say 99.9% of the time it's the most honest opinion you can get. You never know if your review may help someone make a decision, or influence a purchase! Strange how it works isn't it? Link me up if you do do the tag! This is such a good tag, I''ll definitely be giving it a go!